, an ingenious writer on agriculture in the seventeenth century, was the son of a Polish merchant, who, when the Jesuits prevailed in that country, was obliged to remove himself into Prussia, where he settled and built the first house of credit at Elbing, and his grandfather, the deputy of the English company at Dantzick, brought the English company to Elbing; whence that town came by trade to the splendour and result which it afterwards attained. His family, indeed, was of a very ancient extraction in the German empire, there having been ten brothers of the name cf Hartlib. Some of them were privy-counsellors to the emperor, some to other inferior princes; some syndics of Ausperg and Norimberg. 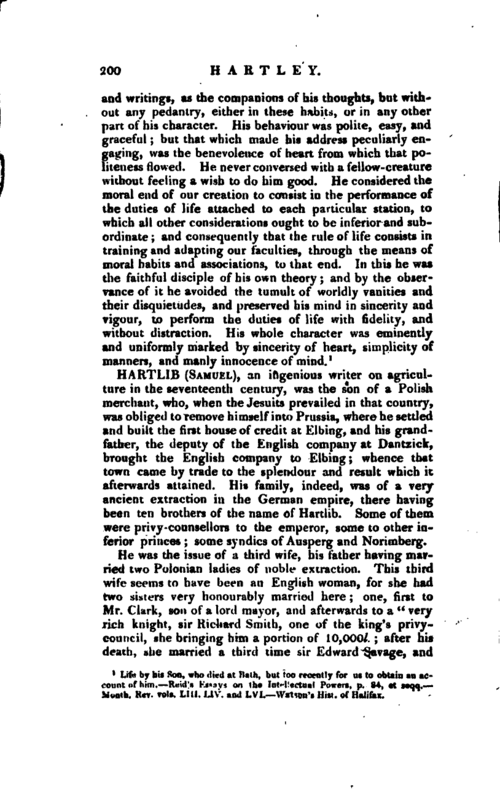 He was the issue of a third wife, his father having married two Polonian ladies of noble extraction. This third wife seems to have been an English woman, for she had two sisters very honourably married here; one, first to Mr. Clark, son of a lord mayor, and afterwards to a “veryrich knight, sir Richard Smith, one of the king’s privycouncil, she bringing him a portion of 10,000l. ; after his death, she married a third time sir Edward Savage, and | was made one of the ladies of honour to the king’s mother. Her daughter married sir Anthony Irby, at Boston,” a knight of 4 or 5000l. sterling a year.“The other sister married Mr. Peak, a younger brother. Warton says, Hartlib came over into England about 1640. In 1641 he published” A relation of that which hath been lately attempted, to procure ecclesiastical peace among Protestants," Lond. 1641. In 1645 he published “The Discourse of Flanders Husbandry,” 4to, about 24 pages; not then knowing who was the author; the “Legacy” to his sons, which relates also to the cultivation of their estates, consists of three 4to pages, and was written on the author’s death -bed, 1645. 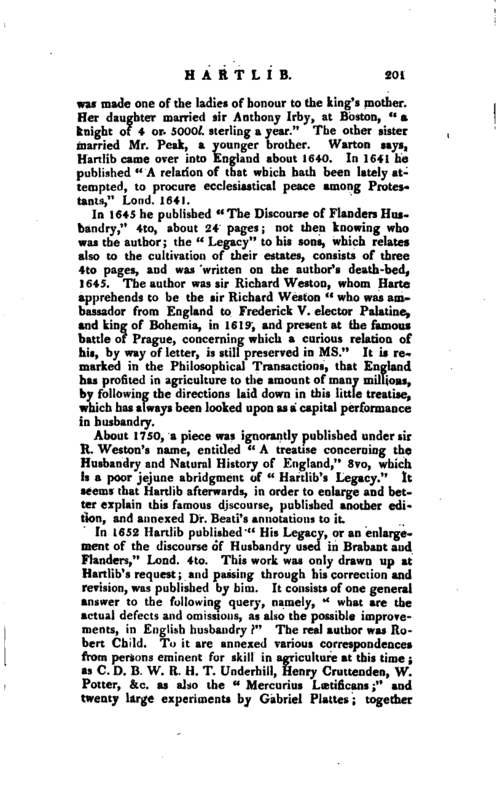 The author was sir Richard Weston, whom Harte apprehends to be the sir Richard Weston “who was ambassador from England to Frederick V. elector Palatine, and king of Bohemia, in 1619, and present at the famous battle of Prague, concerning which a curious relation of his, by way of letter, is still preserved in ms.” It is remarked in the Philosophical Transactions, that England has profited in agriculture to the amount of many millions, by following the directions laid down in this little treatise, which has always been looked upon as a capital performance in husbandry. 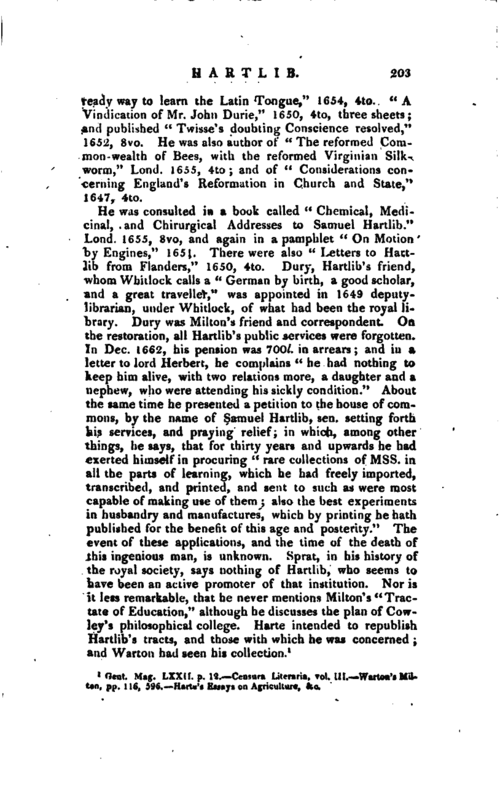 About 1750, a piece was ignorantly published under sir R. Weston’s name, entitled “A treatise concerning the Husbandry and Natural History of England,” 8vo, which is a poor jejune abridgment of “Hartlib’s Legacy.” It seems that Hartlib afterwards, in order to enlarge and better explain this famous discourse, published another edition, and annexed Dr. Beati’s annotations to it. In 1652 Hartlib published “His Legacy, or an enlargement of the discourse of Husbandry used in Brabant and Flanders,” Lond. 4to. This work was only drawn up at Hartlib’s request; and passing through his correction and revision, was published by him. It consists of one general answer to the following query, namely, “what are the actual defects and omissions, as also the possible improvements, in English husbandry” The real author was Robert Child. To it are annexed various correspondences from persons eminent for skill in agriculture at this time; as C. D. B. W. R. H. T. Underbill, Henry Cruttenden, W. Potter, &c. as also the “Mercurius Laetificans” and twenty large experiments by Gabriel Plattes together | with annotations on the legacy by Dr. Arnold Beati, and replies to the animadversions by the author of the Legacy. In the preface Hartlib laments greatly that no public director of husbandry was established in England by authority; and that we had not adopted the Flemish custom of letting farms upon improvement. Cromwell, as Harte says, in consequence of this admirable performance, allowed Hartlib a pension of IQOl. a year; and it was the better to fulfil the intentions of his benefactor, that he procured Dr. Beati’s excellent annotations before-mentioned, with the other valuable pieces from his numerous correspondents. Hartlib says himself, “As long as I have lived in England, by wonderful providences, I have spent yearly out of my own betwixt 3 and 409l. a year sterling; and when I was brought to public allowances, I have had from the parliaments and councils of state a pension of 300l. sterling a year, which as freely I have spent for their service, and the good of many.” He says he “erected a little academy for the education of the gentry of this nation, to advance piety, learning, morality, and other exercises of industry, not usual then in common schools.” This probably occasioned Milton’s “Tractate on Education,” about 1646, addressed to him; and “Two letters to him on the same subject, by sir William Petty,” Lond. 1647, 1648, 4to. 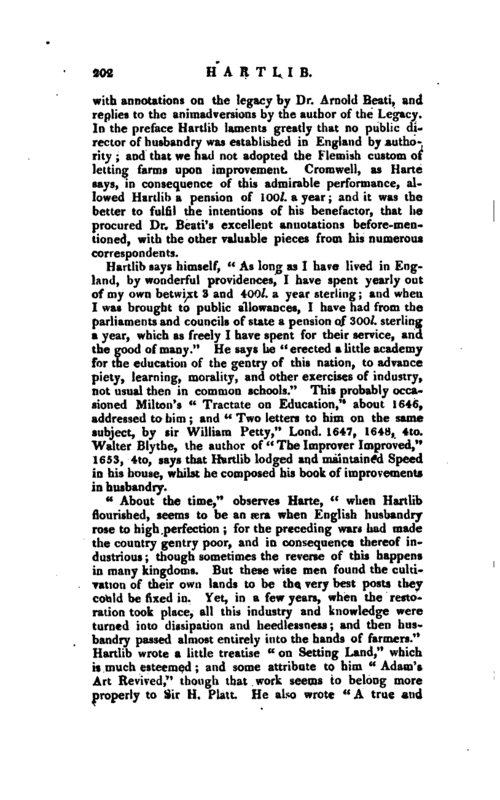 Walter Blythe, the author of “The Improver Improved,” 1653, 4to, says that Hartlib lodged and maintained Speed in his house, whilst he composed his book of improvements in husbandry. “About the time,” observes Harte, “when Hartlib flourished, seems to be an rera when English husbandry rose to high perfection; for the preceding wars had made the country gentry poor, and in consequence thereof industrious; though sometimes the reverse of this happens in many kingdoms. But these wise men found the cultivation of their own lands to be the very best posts they could be fixed in. Yet, in a few years, when the restoration took place, all this industry and knowledge were turned into dissipation and heedlessness; and then husbandry passed almost entirely into the hands of farmers.” Hartlib wrote a little treatise “on Setting Land,” which is much esteemed; and some attribute to him “Adam’s Art Revived,” though that work seems to belong more properly to Sir H. Platt. He also wrote “A true and | ready way to learn the Latin Tongue,” 1654, 4to. “A Vindication of Mr. John Durie,” 1650, 4to, three sheets; and published “Twisse’s doubting Conscience resolved,” 1652, 8vo. 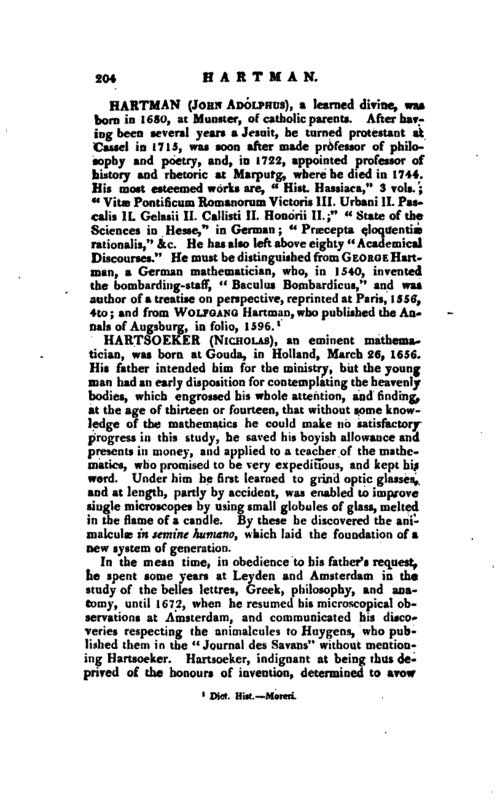 He was also author of “The reformed Common-wealth of Bees, with the reformed Virginian Silkworm,” Lond. 1655, 4to; and of " Considerations concerning England’s Reformation in Church and State, 14 1647, 4to. Gent. Mag. Lxxu. p. 12. Censura Litcraria, vol. III. Wartoa’s Milto, pp. 1 16, 59(5. flarte’s Essays on Agriculture, &c.